This year, Christmas sort of sneaked (or snuck?) up on us. Before we knew it, it was here, and there was no time to prepare the traditional Slovak Christmas dishes (although I am at least going to cook a pot of kapustnica). However, this past weekend I was experimenting with making plum jam. Well actually prune jam, since finding Damson plums is difficult in the United States, and prunes seemed like a good substitute. The jam turned out ok, and I also ended up with half a cup of prune skins spooned off the top of the boiling jam. 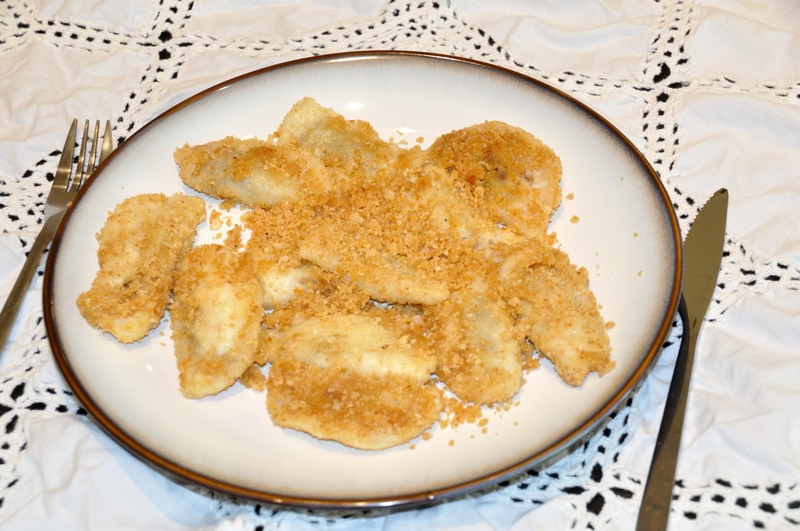 Debating if I should just toss them, I remembered a dish I particularly liked as a child: sweet jam-filled pierogi topped with toasted bread crumbs. I figured the skins would work well as a filling. If you have never had anything like this dish, give this recipe a try. I think you will like it! 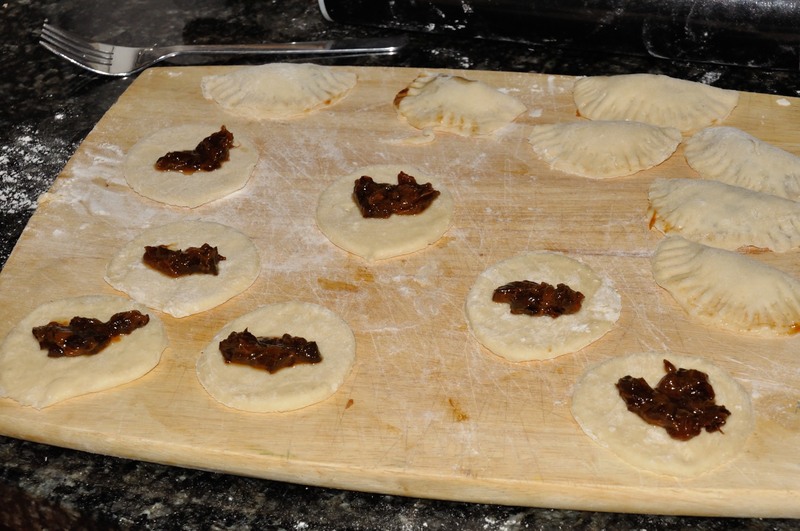 I made these with dough made of white flour, yeast, sugar, water, and a bit of oil. Using a pin, roll out the dough to about 2 millimeters thick. 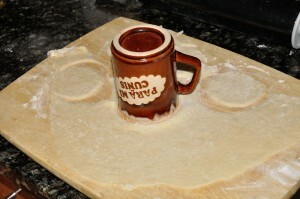 Then use a glass or a mug with the rim dusted with flour to cut out circles. 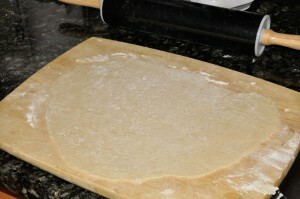 Form the left over dough into a ball, and continue rolling out and cutting out circles until all is used up. Place about a teaspoon worth of the jam in the middle of the circle. Fold over, and then use a fork to seal the edge. 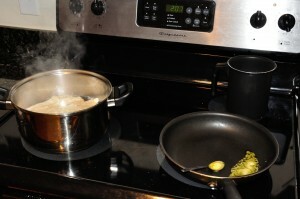 Bring a large pot of water to boil. 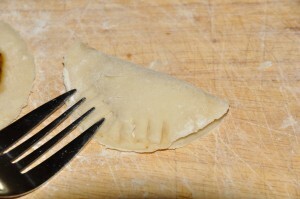 Cook the pierogi for few minutes, until done. 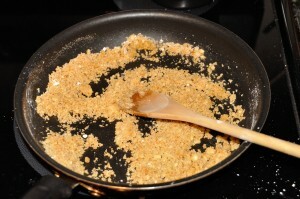 In the mean time, melt butter in a large frying pan. 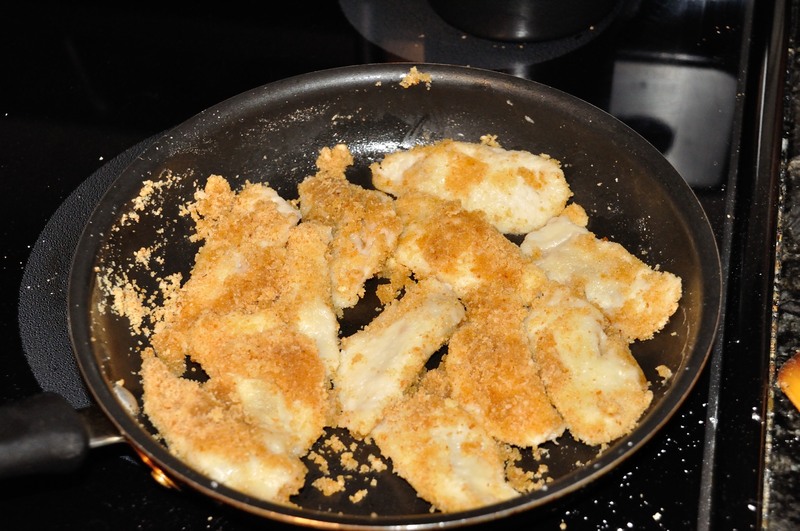 Add bread crumbs and powdered sugar (in ratio roughly one to one, to taste) and toast on medium heat while stirring. 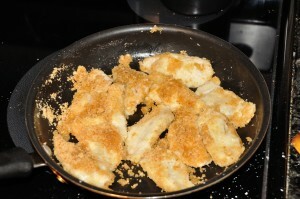 I then added strained pierogi to coat them and to also make them lightly crispy. And that’s it. 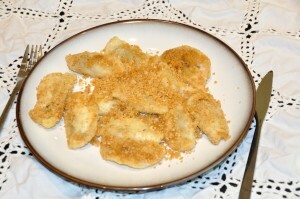 Enjoy one of my favorite Slovak “sweet lunches”. I have not had these in a bunch of years, They are delicious with the evaporated milk and onion sauce, sweet and savory in one bite. These look so good, and I have not had them in years! 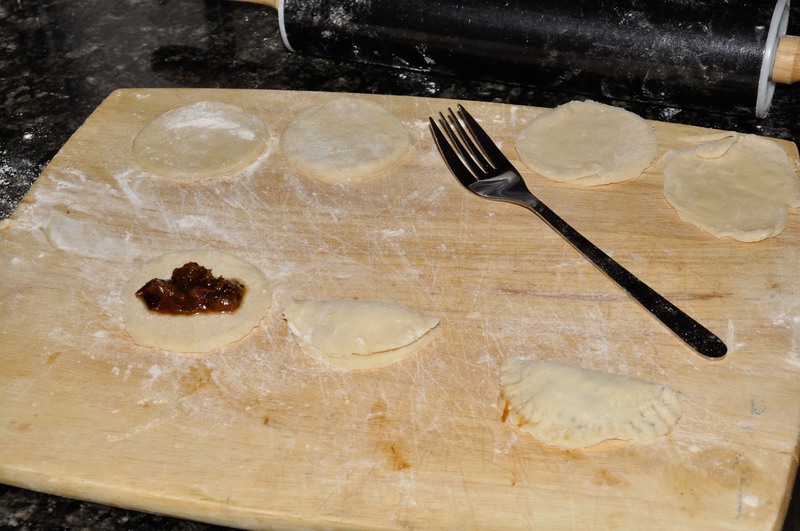 Making pierogi is on my to try list in 2015. Merry Christmas and Happy New year to you! Thanks for sharing your recipes. I love making my own prune/plum jam. For the best fruit, I look for the tiny black plums that are locally called “Italian plums.” They are only available for a short time during the summer, but worth looking for. When I cook the plums down, I puree the skins along with the rest of the ingredients when everything has cooked down really well and also toss in a handful of dried prunes. (I know it’s a cheat, but it works really well.) A good shot of rum is nice, too. This little bit doesn’t taste like rum, but brightens the flavor a lot. After the fruit has been slightly cooled and pureed, the final toucn for me is to let the pot simmer slowly with frequent stirrings until the texture is rather thick. The result is better than the best commercial slivkový lekvar you can buy. Thanks B.J.! Perhaps using the prunes isn’t really cheating because it seems that many prunes are actually made from the Italian variety of plums. My mom made these once when my brother and I were kids and they were so good we fought over them and she swore she’d never make them again. I’m still waiting…so I guess I’d better get on it and try to make them myself. Thanks for the recipe. My great-grandmother, born in Hungary but an ethnic Slovak, made these for the family 50 years ago, and I have never forgotten them. I remember that she made them in squares like ravioli (probably easier for a crowd). Love this website. I am looking for a recipe my husband’s aunt made. It was a pastry filled with cottage cheese and a fruit topping. It was baked, and almost looked like a flat pie? 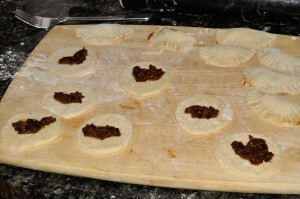 I grew up eating prune pirohy and I still make them. I just cook down some chopped up prunes with a little water and a bit of cinnamon. That’s how my Mom used to make them. Very easy. I make these for friends who only know potato pirohy and they’re surprised at how good they are. My family is of Slovak descent. My mother and grandmother used to make a dish called gule’. They used the recipe for pierogi, rolled the dough out and wrapped the dough around prune plums which are seasonal. 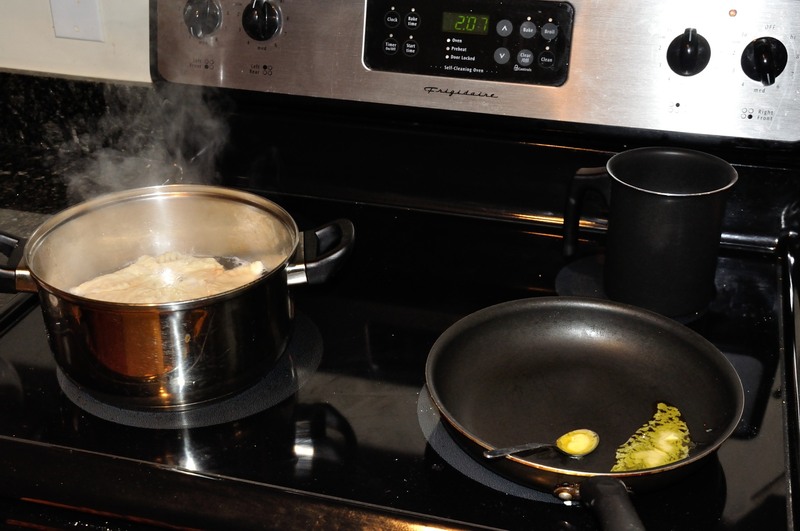 Then put them in boiling water and let them come to top. Put them in melted butter and sprinkle with sugar. The pits are still in the plums but the inside of dough turns reddish purple. More like a dessert but yummy! Not sure the spelling of gule’ is the right one. I forgot to mention also xmas eve a must.